Our brand new responsive V3 inventory platform includes a completely redesigned interface along with a number of new feature enhancements. A free upgrade to all PowerUp subscribers, V3 inventory will provide a completely new model overview page for new vehicles – integrating both build & price as well as in-stock available inventory. Used inventory has never been easier to navigate with the additions of infinite scroll and multifaceted search. Responsive Design – Users can access all new responsive V3 features and tools from PC, Tablet, or Mobile phone with a completely optimized experience regardless of their screen size. Infinite Scroll – Like Facebook and Twitter, as users scroll through New and Used Inventory, the page continues to load additional inventory pieces automatically, rather than a “Next Page” button. National/Regional Incentives – Leverage New Vehicle Incentives on both Build & Price as well as your In Stock new inventory. Shopping Assistant – Using comparative analysis, V3 Shopping Assistant will recommend vehicles to users based upon their onsite shopping habits. Multi Faceted Search – Narrow search by multiple filters within the same category. For Instance, a user may select [SUV] [BLACK] [MERCEDES] [LEXUS] [BMW]. 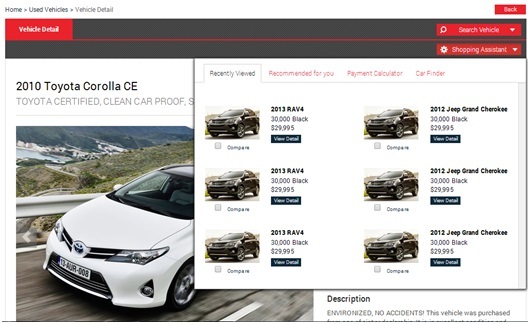 Unlike most platforms where users can only select 1 Make at a time, for instance [BMW], V3 Inventory allows users to select multiple filters from the same categories. Real Time Dynamic Search – Allows users to free form type their search on any page – generating results for both new and used inventory.